Patrick Hruby: The NCAA-EA Sports Divorce: Now What? Shed a tear, sock-color-obsessed online roster makers: The NCAA is out of the video game business. Abandoning a profitable partnership that lasted more than a decade – and even produced a college baseball title – the NCAA announced Wednesday that it won’t renew its contract with game maker EA Sports. The reason? The ongoing federal antitrust lawsuit filed by former UCLA basketball star Ed O’Bannon against the association, which in part argues that O’Bannon and fellow plaintiffs such as Bill Russell and Oscar Robertson are entitled to a share of the millions of dollars in revenue the NCAA earns from video games and other products that use their names, images and/or likenesses (NIL). Wait a second. 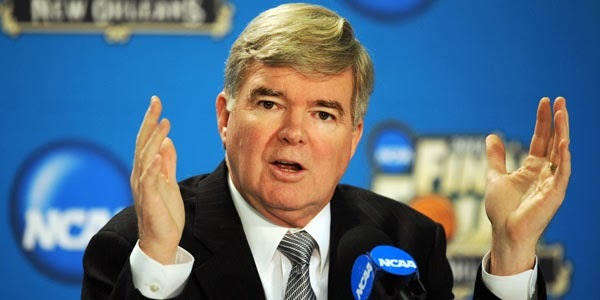 You say the NCAA nixed its deal with EA Sports because of the O’Bannon suit. But it released a statement claiming that they are ”confident in [their] legal position regarding the use of our trademarks in video games.” What gives? What gives is lawyer-ese. The NCAA is never going to publicly say that the O’Bannon case has them scared, because that would imply they’ve done something wrong and therefore have reason to be afraid of adjudication. However, the current facts of the case don’t look good for it: O’Bannon’s claim is rooted allegations that the NCAA and co-defendants EA Sports and the Collegiate Licensing Company colluded to profit from the unauthorized use of former players’ NILs – price-fixing their value at zero – and documents uncovered by the plaintiffs’ lawyers during discovery strongly support said allegations. The other tell? Check out the rest of the NCAA’s brief statement, which says that “given the current business climate and costs of litigation, we determined participating in this game is not in the best interests of the NCAA.” (Bold added.) In this case, current business climate and costs of litigation are lawyer-ese for ruh-roh. Any other reasons the NCAA dropped out of the video game business? It’s possible that the association is engaged in a bit of (not uncommon) public grandstanding: hey gamers, those greedy O’Bannon plaintiffs are ruining all of your fun! It’s also possible that the NCAA is trying to influence both the news cycle and public perception in advance of O’Bannon’s lawyers filing an amended complaint, which is expected as soon as Thursday and may add active college athletes as plaintiffs. So does the breakup help the NCAA in the O’Bannon case? “Member colleges and universities license their own trademarks and other intellectual property for the video game. They will have to independently decide whether to continue those business arrangements in the future.” (Bold added). Of course, just saying something in a lawyer-vetted statement doesn’t always make it so. Remember: the NCAA is its member schools, and those schools are the NCAA. The price-fix alleged by O’Bannon is that those schools conspire to not pay athletes via amateurism. If said price-fix continues in future games, the association could still be forking over antitrust damages due to joint and several liability — even if its big blue circle no longer appears on an EA Sports game box. OK, so the “NCAA Football” franchise is dead. Why can’t schools, conferences and entities like the Heisman Trophy simply continue to contract with EA Sports through the Collegiate Licensing Company to make essentially the same game in the future, only without the NCAA’s logo and imprimatur? Most of the game’s imagery is licensed through the Collegiate Licensing Company, an altogether separate entity that handles the licensing business for more than 200 colleges and universities, plus athletic conferences and bowl games. However, here’s the problem for EA Sports, the CLC, schools, conferences and bowl games if they continue with “College Football 15” and beyond: Unlike the NCAA, they won’t be increasing their odds of dodging future liability. Instead, they’ll be on the financial hook. A loss or settlement in the O’Bannon case also would set a precedent for paying players for the use of their NILs, making future college football games less profitable and potentially not worth the trouble. But couldn’t EA Sports and schools get around the NIL stuff by making sure that the on-disc roster players in future college football games have NO resemblance to real-life athletes? Make white players black, randomize skill attributes, give quarterbacks receiver uniform numbers, and so on? And then let those online roster editors work their magic? 1. Annual sports video games are often derided by non-sports gamers as little more than “roster updates.” This is hardly the case: working in a severely-compressed timeframe, developers at EA Sports and elsewhere add graphical updates and gameplay refinements with each iteration of a game. That said, updated rosters are probably the biggest reason to purchase new sports games each and every year - otherwise, why not play last year’s (mostly similar) game and save 60 bucks? A college football game full of randomized, generic rosters likely wouldn’t sell as well; if it became unprofitable, EA Sports would certainly cancel the title. 2. If O’Bannon wins his case, judges and juries aren’t likely to look very kindly on anything that appears to be a sneaky way of sidestepping paying college athletes. Trial lawyers will take advantage. In that kind of climate, EA Sports and/or the schools involved in “College Football 1X” may decide that making a game is too much of a hassle. Fine. So why not give those players a cut of future video game revenue? Granted, more money for athletes means less money for schools, conferences and bowl games. Still, it’s a financial win-win. Right? Wrong. Michael Hausfeld, the lead attorney on the O’Bannon case, reportedly said the NCAA cutting ties with EA Sports could provide greater freedom for the game-maker to strike a deal with players. Truth be told, EA Sports would be more than fine with paying college athletes directly for their NILs – it would make for a better game, along the lines of “Madden NFL,” and likely better sales. Moreover, the company’s defense in the O’Bannon suit boils down to asserting that it didn’t conspire with the NCAA to fix prices for athlete NILs, but rather was forced by the association to comply with a pre-existing policy of price-fixing. At its core — and despite the plaintiffs’ lawyers insistence to the contrary — the O’Bannon case isn’t just about narrow price-fixing for NIL compensation in video games. It’s about the widespread price-fixing for athletic talent inherent to college sports amateurism. Like most big lies — particularly ones grounded in ridiculous tautological logic – amateurism is an all-or-nothing proposition. College athletes can’t be paid in any way because they are amateurs, and if they were paid in any way then they wouldn’t be amateurs. If you admit that college athletes deserve market compensation for anything — for instance, by cutting a video game rights deal with those very same athletes — then you run a very real risk of admitting that the whole NCAA system of schools colluding to deny market prices and basic individual economic rights via capped scholarships and “impermissible benefit” boycotts is an enormous, immoral sham. What follows isn’t a slippery slope; it’s a gaping sinkhole. Which is why the NCAA and its member schools fight so hard to police things like permissible bagel toppings. They have to double down. Always and forever. Otherwise, the center won’t hold. In the long term, going without a licensed video game will cost the college sports industrial complex money, but going without amateurism would cost it a whole lot more.